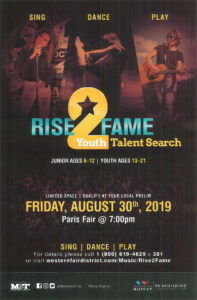 Do you SING, DANCE or PLAY and are between the ages of 6 and 21 then the Rise 2 Fame Youth Talent Search is looking for you. Every year the Paris Fair, in conjunction with the Western Fair District and other fairs and festivals across South Western Ontario organizes a Youth Talent Search to give the youth in our communities a chance to perform in front of a live audience. There are 17 preliminary contests across Southwestern Ontario for you to choose from. Preliminaries are held all summer in communities from Teeswater to Essex. The winners of those regional competitions will travel to London to compete for up to $1500 in prize money in the finals during their 10 day fair. Review the Eligibility Rules and Regulations and complete the Preliminary Form. Your information will be forwarded to our Committee so that we are prepared for you on Friday August 30th in the Exhibition Hall. Once we have a list of all contestants, an admission pass will be emailed to you – watch for an email from ticketscene.ca. Family and friends wishing to watch the show can purchase their admission tickets online at ticketscene.ca now or at the fair entrance the day of the search. We look forward to seeing you at the 161st Paris Fair!